I probably wouldn’t normally review a two-track release that doesn’t even crest half an hour but whereas half the proceeds from the sale of this one go to guinea pig rescue efforts (no, really), how could I say no? 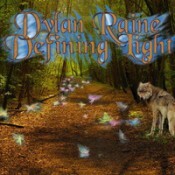 Defining Light is Dylan Raine’s fifth release but the first I’ve heard of him. Here he provides two tracks, one about 20 minutes long and the other a shade over six. The longer one, “Journey Into the Light,” almost loses me, but seems to keep barely salvaging itself. Early on, its blend of nature sounds and an operatic sort of voice keening and crooning make me wonder if I want to listen. A sudden–perhaps too sudden–stop, and the track shifts into a different place, something darker, full of clattering sounds. It’s interesting for a short stretch but never sheds an uncertain feeling. Raine hits his stride halfway into the thing when he clicks over to a straightforward, sequence-driven stretch with a classic EM feel. I could do with fewer bird sounds here, but at last I feel like I want to stick around for the ride. It almost feels like Raine stuck two (or three, depending) very different thoughts together and it’s only the last one that’s fully realized. Although it wouldn’t be right to tell you to skip to the eight-minute mark here…you may want to think about it. The second track, “Forest of the Innocents,” is more accessible right off the bat, though I feel Raine could have dialed down the water and animal sounds here.This is a happy piece of work, burbling and light in tone as it tells its tale with a New Age tint to its palette. If you feel like saving a guinea pig or two, Defining Light is worth checking out. Available at Dylan Raine’s web site.